The volume of oil sitting in 300 steel tanks in a nine-square-mile radius in Cushing, Oklahoma has long been a key barometer for the health of U.S. crude supply and the nation’s benchmark for daily trading of billions of dollars in the commodity. 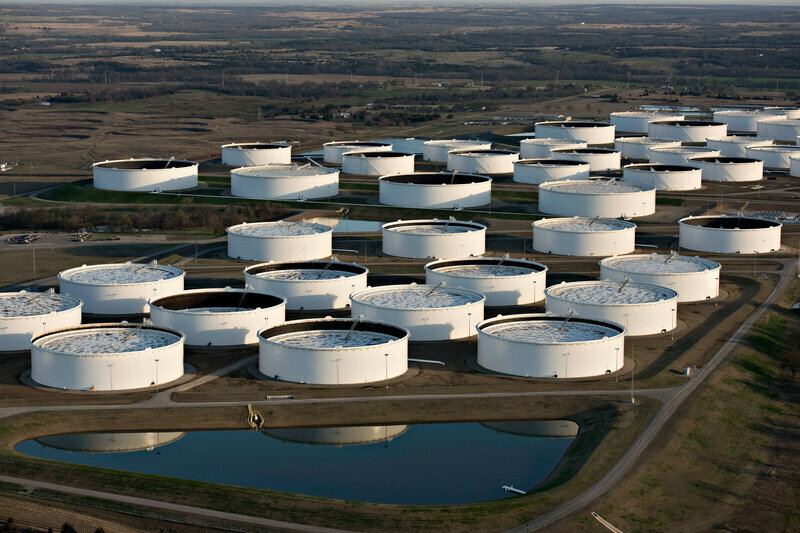 But those tanks could soon drain to levels near effectively empty, even as U.S. oil production soars past a new record of 10.4 million barrels per day. Oil supplies have fallen before in Cushing for a variety of seasonal or market-driven reasons. But this time, there is no shortage of crude in the market. In fact, U.S. production is straining pipeline and storage capacity. The declining volumes stored at Cushing reflects a more permanent shift, underscoring the hub’s waning influence as the primary measuring stick for the U.S. oil market and the leading barometer of future supply, demand and prices. Companies are now spending millions of dollars building infrastructure to facilitate trading and storage elsewhere, such as in Houston and other Gulf Coast ports. That could pave the way for a change in the U.S. benchmark oil price, used to value tens of billions of dollars of crude and futures contracts every day. The current benchmark - called West Texas Intermediate crude, or “WTI” - has been derived from the price of physical oil delivered to Cushing for more than three decades. Traders and major global crude buyers have advocated replacing WTI with a new benchmark futures contract that would reflect the value of crude delivered to the Gulf Coast. The price of oil in Cushing - which bills itself as “the pipeline crossroads of the world” - is used to value crude grades produced around the United States and some oil imported from Canada, Mexico, and South America. Prices at the hub also provide the basis for an average of 1.3 million WTI futures contracts CL-TOT - worth about $82 billion at current prices - that change hands on the CME Group’s New York Mercantile Exchange every day, making it one of the world’s most actively traded commodities. But as more pipelines are built to take oil from U.S. shale fields to Gulf refineries or for export markets, much of the crude produced in the giant Permian Basin oilfield in Texas and elsewhere no longer passes through Cushing. Instead, producers are increasingly shipping directly to seaports such as Houston, where vessels carry the oil to dozens of countries worldwide. That reflects a major transformation in global crude flows since the United States lifted a four-decade ban on oil exports in late 2015. Some traders and buyers argue the benchmark needs to change to reflect this. Joshua Wade, a crude oil marketer in Oklahoma, sees the benchmark delivery point moving south before long. Inventories in Cushing fell to 28.2 million barrels in early March, lowest in more than three years. Analysts say a level of 20 million barrels is effectively empty. That’s because tank design necessitates a minimum volume of crude be kept on hand to maintain the physical integrity of the complex and to allow for blending different crude grades to comply with pipeline specifications. Cushing got its distinction in the early 1920s when tanks sprung up to store oil en route from Oklahoma and Texas to major metropolitan areas and refineries in the Midwest. In 1983, it became the delivery point for the newly-launched WTI futures contract CLc1. Because the U.S. relied on imports - and banned exports - Cushing was key for traders to gauge domestic supply trends. BP’s former head of crude trading, Donald Porteous, earned the nickname “the King of Cushing” because of his deep understanding of supply logistics in the Oklahoma town - a strategy that often earned him more money than BP Chief Executive Bob Dudley. Porteous, now retired, declined to comment for this story. Now, new pipeline projects head straight from west Texas to the Gulf of Mexico, a route well south of Cushing. Lately, Permian Basin prices have declined because pipelines can’t be built fast enough to get crude to the Gulf, even as pipeline firms have added about 600,000 bpd in capacity since late last year, according to data compiled by Reuters. “We’re trying to make sure we’re ahead of the pinch points for producers to bring product to refiners or to export,” Greg Armstrong, chief executive of Plains All American, said at a recent industry conference. Projects in the works could boost outgoing pipeline capacity from the Permian from 2.7 million bpd in March to more than 4.5 million bpd by the end of 2019, according to energy industry information provider Genscape. Meanwhile, the Dakota Access pipeline started shipping oil last year, running out of North Dakota’s Bakken shale region to the Gulf - bypassing Cushing. And Marathon Petroleum is considering reversing its Capline crude line to bring barrels from Illinois to the Gulf. For now, traders watch the price differential between WTI and London-based Brent crude to determine where to ferry shipments globally. But traders say the price of physical trades in Houston is growing more important as a barometer for shippers. Earlier this year, even as the WTI crude discount to Brent WTCLc1-LCOc1 narrowed, Houston’s discount to Brent remained steady at about $1.60 a barrel, analysts said, helping buoy export demand. As pipeline capacity to the Gulf has increased, and storage has expanded, demand to park barrels in Cushing has waned, said Carlin Conner, chief executive at SemGroup Corp (SEMG.N), which operates about 7.6 million barrels of crude oil storage in Cushing. A spokesman for Magellan Midstream Partners, which owns about 12 million barrels of Cushing storage, said it will remain important because of its connections to the Gulf and Midwest. Cushing is also connected via pipeline to the Gulf, 500 miles to the south, and can offer cheaper storage than what’s available on the coast, said SemGroup’s Conner.